I read once that one of the reasons the Germans had such problems with their paratroopers was the harness. Like most cartoons, the harness connected to a single point on the back, leaving the trooper with no way to steer. US & British chutes had a full harness that attached at the shoulders. The US version had special cords the trooper could pull to steer and even stall the chute. The steering “cords” are called toggles. Another major difference in paratrooper doctrine is that the fallschirmjaer jumped “naked”, i.e., without their small arms, which were parachuted down in a separate weapons canister. Many of them carried pistols in a pocket of their “bone sacks”, i.e., jump smocks, putting them at a distinct disadvantage until they could locate the weapons canisters and properly arm themselves. Joseph D. Thompson was one of the officers amongst the 101st Airborne Division, which successfully took the leading role in liberating the occupied areas in the Netherlands, Austria etc. He is our hero, of whom we have not been able to learn more than just a photo taken in Austria in the spring 1945. We would be delighted to hear anything about his later life in the USA. Are you a member of Fold3? If so, enter his name in the search box on the home page. It could bring up all sorts of information about him. If not, find a family history center of The Church of Jesus Christ of Latter-day Saints near you. They will help you access Fold3 and many other sources to find information on Joseph. Thank you for your kind advice. I am not a member of Fold3, but must consider it now. Actually I’m a Finn, but my mother met with Mr. Thompson in Austria back in 1945 and gave birth to their child in February 1946. This child is my elder brother, who would just be delighted to hear anything about his handsome father. All we know is that Joseph was about to leave from Europe in September 1945. I remember when I was in the second or third grade (1957-1958) that my teachers husband had died while jumping on D*Day. I believe he served in the 101st. God Bless Him and all the others who served! My father was WW II member of 508th PIR. As an officer, mostly did training state side. Was on a ship near the signing ceremony for Japanese surrender, then a member of the Occasional Forces after. I think he was also in the 511 th. My wifes uncle was a member of the 101st Airborne and was in the gliders that landed in France after D Day. He also ended up in the Ardeenes during the ” Battle of the Bulge” and was able to survive but would never say much about it after he came home. My father was in the 101st and in the Gliders that landed in France. He also survived. I have been to fold3 and can’t seem to navigate to the 101st or any paratrooper section. I put in his name and lots of hits come back but none are in the “paratrooper” divisions. I even tried typing in paratrooper but nothing come back like 101st or 82nd. I am very confuse by this site. May be me though. My father Robert Woten was a glider pilot in France. He also would never talk about it. There must’ve been a lot of horrible things happen and loss of friends. I never got any details. I know he spoke of a friend Skip who survived also. He survived all his glider missions but then lost his life in a crop duster plane crash at the age of 53. He loved to fly and died doing what he loved. I would love to hear more about men like him who flew those glider missions never knowing if they would have a way to return. Amazing! My cousin Glen Lofties was in the 101st and jumped in on DDay. He was also in the Battle of the Bulge. He was awarde two bronze stars and some other medals. However, they were lost shortly after the war when his parents house burned. I’ve been told that many of these records were lost in another fire that burned records in St. Louis. My brother Frank was in the 17th He landed in France by glider. They crash witch many did. When he returned to England he in listed in the paratroopers because it was safer. He then jumped in to France. Got hung up in a tree. Cut himself free and fell 25 ft. to the ground. Broke bones in his back. Never said anything but, the “Germans one night passed with in 50 yards and no one fired a shot” He came home and lived to 97. My father was in the 17th, 193 GIR; he made 3 glider invasions, and survived. You need to give the British Special Air Service, SAS, a lot of credit as they were dropped behind German lines in all of the N. Africa and European Campaigns. Not only used as light infantry but also mobilize infantry. My father was an army medic in The Battle of the Bulge also in the Ardennes. Drafted at a young age and trained in Texas. Never talked about it when we were growing up. Wears a WWll cap proudly and at times would join buddies for summer picnics given in their honor. My husbands aunt made the parachutes when enlisted as a wave. She belonged to a group of waves with her sister for many years until it was disbanded when all werre getting up in age and became too difficult to travel. They were a special group of ladies. Glad you mentioned the WAVES. Women made a tremendous contribution making the war winnable by not just filling essential positions in the women’s services but working on the home front. My mother and all her cousins worked at the Fall River Shipyard in Quincy, Massachusetts building ships and taking the places of men who went to war. In reality, whether working on the home front or being overseas, all Americans were ‘at war.’ Thanks for posting. My Uncle was a Medic in the Battle of the Bulge, & trained in Texas, also. Do you know what battalion/unit? He was in the 84th Infantry Division, 334th Reg. – in Germany and Belgium. He was shot in Belgium and another time and then sent back to his unit. He does remember names of some of the men he trained with in Texas and mentioned how hot the marches were that the men would be passing out due to the heat. If anyone knows a book that was published about the 84th Infantry please let me know how to order a copy for my father is still living and would appreciate seeing a copy. The division was called the Railsplitter Division and I found a summary online on ushmm.org. We did take him to Washington to see various monuments which he seemed to enjoy the trip but I’m sure it was emotional at times to see all those names honored. I will try to get a few names from him to see if anyone on this thread might have a family member in the same location during those years. This is some books talking about the 84th … I know one vet still alive who lives in Alexandria VA .
My uncle Dale Collon Hudson, Aredale, Iowa was in the 82nd Airborne Company F and was a paratrooper pathfinder. He departed from England in plane #10 on the eve of D-Day. My father (his brother) thought he was in a glider. He was killed on June 16th, 1944 (10 days after D-Day). Twice, Uncle Dale purposely ran into the line of fire to save his comrades. He was a very handsome, athletic and smart man. He received medals. A few years ago, I found a man who said that his father was a very close friend of my uncle Dale. He said that my Uncle Dale’s picture hung up in his parent’s living room and his brother was named after my Uncle Dale. This was a true friendship born in the war. Six months after Dale died, My father was drafted and signed up for the paratroopers; however, he was sent overseas to Italy before his paratrooper training due to changes that were occurring with the Battle of the Bulge. Another brother Carl Hudson was in the Naval Air corps and died in an airplane crash in 1946. During this time, their sister Doris was in the WAVES. It had to be a rough time for this family of 13 in rural Iowa. MY BROTHER WAS IN THE 82nd AIRBORNE IN THE ASHAU VALLEY IN ’67. HIS UNI T WAS OVER-RUN AND HE AND HIS FOXHOLE BUDDY WERE AMONG THE FEW TO SURVIVE. HE GOT THE BRONZE STAR FOR VALOR AND WAS APPOINTED THE BATTALION C.O.’S DRIVER FOR ABOUT A WEEK TILL HE AND A BUDDY GOT DRUNK AND TOTALED THE JEEP IN A RIVER BOTTOM. HE WAS IN THE FIELD THE NEXT DAY. My father was with the 101st Airborne during WWII and I many pictures of which he took when he was over seas. He was in a platoon that was following Hitler, and I have pictures of his car after they recovered it. I have other things that my father received from the time he and his Army buddies went through. He made a friend in Holland, Switzerland and I am sure other places, I love the souvenirs he brought back. I have been trying to seeing if any of his buddies are still alive. My father passed away in 2003. My Great Uncle Harold E. Hibbard was in the 101st Airborne and parachuted into Ste Mere Eglise in Normandy, France on D-Day. He didn’t survive the jump. He was one of 5 brothers that served in WWII. The rest came home and lived into their 90s. My Grandpa, his brother, spoke of him until his dying week, as if he was with him days before. I was blessed to be in Normandy for the 70th anniversary. We camped on the beach with thousands of others. It was amazing. I was honored to touch the land that buried my Uncle until nearly a decade later when it was safe to bring him home. Reading the stories you all have posted has meant a lot to me. I will cherish each of these stories. My Father was a paratrooper in the 11th that jumped into the Philippines he also jumped into Germany. All of his children were girls so we didn’t get many stories about the war but he told all of his grandsons a lot more about that time in his life. My husband was a combat medic in Vietnam and I have found throughout the years that most, if not all, veterans who saw combat don’t about their experience. My brother was also in the Navy in the South Pacific in WWII and never told anyone what he saw. He use to have terrible nightmares as well as my husband does. I an sorry I left out the word “talk” about their experience. My father, Kenneth F. Nelson was in Headquarters Battery, 376th Parachute Field Artillery Battalion, 82nd Airborne. He was in from North Africa through Germany, serving as Staff Sergeant. Among other awards, he received the Silver Star, Purple Heart, and Belgian Croix de Guerre avec Palme, along with five Bronze Stars. He never let on that he was any sort of war hero, but in his later years, he told me many war stories. Dad served much of his time behind the lines as a radio operator calling in and directing fire on the enemy. He told me about many times when divine intervention was the only thing that kept him alive. A few years before he died, he wrote a short manuscript summarizing his war experience. It is a gift that is one of the most prized things he left us. We are only now realizing the costs that the ‘Troopers paid to help maintain and guarantee our freedom. We are both proud of and thankful to all of them. I forgot to add that though Dad (Kenneth F. Nelson) served in the 82nd All Americans throughout the war, he was transferred to the 101st at the end of the war and came home a Screaming Eagle. I don’t know which unit he was in after the transfer, but would love to find that out. His manuscript was only about 15 pages long, so I doubt it would be “publishable” on its own, but I was wondering if there are others who have written their experiences. It would be wonderful if someone were to put together a book of remembrances like that, and I wouldn’t be averse to including his stories in a collection. Good luck with your research. I’m glad that I started on Ancestry to be connected to all of these families with veterans. I will be seeing my father today and would like to have his stories recorded by our local WWII group that links these stories to the Library of Congress. You could probably do that also and look into any resources that would honor these men with a published book. I would love to see that happen. If you have a local filmmaker that plans on doing a documentary about our WW2 paratrooper families, I would like to get my uncle’s story ( 513th PIR, 17th Airborne Division, Battle of the Bulge ) included. I plan to call his office just to see if any plans are being made to publish those interviews before all these soldiers pass. We have a local organization that has speakers on a regular basis but I do not know if they record the speaker. Google under Lehigh Valley Veterans History Project. Dominique Poitiers, would the foreign military offices have records of the medals they gave to the soldiers? I might be able to find something for my father there, B.P. Fuller. I am sure the Belgian office might have some records, if so. Thank you. You are doing us all a wonderful service. Hi Gilbert! My dad told us he did the same for a time when he parachuted in. We were watching some war movie when I was a kid, so this must have been the late 50’s or early 60’s. He said the radios were the crank variety to generate the electricity to send it. Originally, he was just carrying it in a backpack, and his senior officer was calling in the coordinates, but he got killed so my dad took over. That’s exactly what dad always told me. It was a multiple-person job, because not only did they have to carry the radio, but they also had to carry the line, because they didn’t transmit over the air. Basically it was a huge telephone line. One time when Dad was out on a mission, everybody else on the team was killed, so Dad captured a German (turned out it was an officer), and made him carry the radio and line up a hill. Boy was that a mess! Since he was an American and the other guy was a German, both sides were shooting at them. Plus, it was against the rules to make an enemy officer work. After they survived that day, when Dad turned the officer in, the German filed a complaint against him. There was some sort of trial after that – a court martial trial, I believe. When they questioned Dad, he told them that he had to finish the mission, and he couldn’t do it alone. When he captured the German, he was too deep in enemy territory to turn him over, and didn’t have time to do it, so his choice was to shoot the officer and fail in his mission, or else one of the two was going to have to carry the line and the other one carry the gun. Dad wasn’t about to let the German carry the gun. After the trial, instead of convicting Dad, they ended up giving him a commendation. WOW! I love this story!! What an amazing thing our guys did in that war!! And such a sense of humor too. Daddy always said the only reason why the alleged most decorated man in WWII, Audy Murphy, got all the medals was because he had a war correspondent assigned to record all his actions. If all the men who did heroic things had reported them, they would have a chest full of them. But bragging, or even discussing these actions, was frowned upon back then. Daddy held court every Sunday at the club room at Tenneco Country Cub, and besides giving us kids all that acreage to play in, it gave him an audience to regale with his knowledge of the war. Back then, a lot of men got jobs because of their service. He had only a 7th grade education due to the Depression, when his father abandoned the family, but Tenneco made it possible for him to go to night school to get special training for his work in the accounting department. It is a shame more companies today do not honor our war heroes and soldiers with the same commitment the earlier companies did. Now it’s all about Wall Street and profits. The President of the United States of America, authorized by Act of Congress July 9, 1918, takes pleasure in presenting the Silver Star to Technician Fourth Grade Kenneth F. Nelson (ASN: 17045079), United States Army, for gallantry in action while serving with the 376th Parachute Field Artillery Battalion, 82d Airborne Division on 7 January 1945, near ****, Belgium. Technician Fourth Grade Nelson, on duty with an artillery liaison party, accompanied the attacking company of infantry and tank destroyers on the mission of securing the towns of **** and ****, Belgium. Strong opposition was met by our force and the two leading tank destroyers were knocked out. Technician Fourth Grade Nelson, assisted by another member of the artillery liaison party, laid a vital line of communication over a distance of 2,000 meters, half of it through terrain in the process of being neutralized, and which was continuously under heavy fire from enemy artillery, machine guns and small arms. Several times during the attack Technician Fourth Grade Nelson had to fight off enemy snipers with rifle fire, and, although wounded by artillery fire, continued to lay and service his line until the mission was accomplished. This gallant action not only provided communication for the artillery forward to render very close artillery support for the attacking infantry, but also kept the infantry headquarters informed, materially assisting in the accomplishment of the mission. Thanks! I know Dad had the orders somewhere in his papers, but we haven’t come across them yet. Oddly enough, even though he told me about many things from his army days, that’s one day he rarely talked about. We have some soldier working in DC who maybe could help you, if not fell free to contact me again . We had a dear friend, now deceased, who was with the 82nd Airborne. He jumped into Normandy at 2 am on June 6, 1944. Had a few stories to tell, that he had kept bottled up. He then jumped into Holland at Operation Market Garden. German paratroopers were actually part of the Luftwaffe not army. Their “success” was part due to weapons canisters being dropped and not being carried by their personnel. Casualties were considered excessive in the Crete operation and their use discouraged. Later, these losses would pale as insignificant compared to those incurred on the Eastern Front by the Wehrmacht. To the people who wanted to hear stories of paratroopers and glider pilots. I once knew a family from Revere, Massachusetts, whose father was a colonel in the Polish Air Force, He was commander of a glider group that flew countless missions into German territory in WWII. He was shot down four times, wounded he made it to England, was nursed back to health and went back to do it all again. He finally wound up marrying the nurse who kept putting him back together again. After the war she refused to move to Poland, where he was a national hero. Instead they came to America. Had two children…a daughter Irena (would be about 73 today. ALSO a son whose name I don’t recall. His name was BZOWSKI (or BRZOWSKI) Don’t remember a first name. He was about 6’4″ and very muscular, hard working and soft spoken. Her name was Patricia. He worked as a bricklayer which was very demeaning for a man of his background. They were such a wonderful family I often wonder what happened to them. Last time I saw them was 1959. Would welcome any news of any of them. Now, I have pictures he took when he was over there, wondering if you would like to see them and how? I’m really Lucky to meet many Airborne Vet from WW2, KO, VN and moderne war … all these heroes are important for me . I have different way to keep the memory alive … My wife and I we have adopted several US grave here in Belgium . I also have driven several US Vet or family in the Battle Of The Bulge area as well as in Normandy . I’m a member from the 505PIR and 508PIR family and Friends Association and have been several times in US for reunion . I’m looking for names, ASN, Unit and Cie, Combat Jumps or Glider landing … and hat for the 11th, 13th, 17th, 82nd, 101st and independent units like 517PRCT, 509PIB, 550GIB, 551PIB . Any helps will be great … just need to say I’m not a writer and don’t want to write any books with my info … just want to help FAmily when they are looking for info . I wanted to thank you for all your efforts. I am very grateful that the memory of what all our fathers, uncles, husbands did in WWII is still kept alive. Your research is invaluable to all of us. It is so appreciated. Have you been in contact with Jan Bos? He’s from your neck of the woods, and he has written the only book that I know of about the 376th Parachute Field Artillery Battalion of the 82nd. If not, he may have some information to add to your database. Thanks you once again for all that you are doing for all of us! We family members should all be very grateful to you and those in Europe, especially in France, Holland & Belgium, who have done so much to help us find our own history. I have been to Holland twice amd spent a lot of time with the like of Tom Peeters and others like yourself who are so dedicated to the cause & entirely helpful. I look forward to travelling to Belgium within the next few years and hope to shake your hand and thank you in person. Thanks Justin , could you tell me more about your grand father ? To refresh: Harold Manginii (Garfield, NJ)327 GIR ‘C” co 101st. He fought from Normandy to the Eagles Nest without a scratch. He only opened to me and I have a decent amount of stories that he shared. One in particular I am interesting in finding when I come to Belgium. He was highly decorated vet . On that note, I really would like to spend Christmas in or near Bastogne when I come to Belgium. Thanks for your wok. Do you have his rank and ASN ??? he is still alive ??? Cindy, I know the 84th ID … During the Battle of the Bulge they were in my garnison city … Marche En Famene … and I met several 84th Vet … Are you in touch with the 84th ID association ? No. Not familiar with this organization. Let me know who they are please. Justin, I’m really interesting by all you would like to share with me : my email is paracsm@hotmail.com . Your father was he buried in Tom Rivers NJ ? Yes he is buried in Toms River, NJ. Cheers to You and Your Family, and all the Folks Who take care of the Graves of Our war dead! And Thank You for Your service to the free world! My mother’s brother Caley Jones Eady was with the 501st Airborne. He jumped on D-Day, June 6, 1944. He was listed as missing in action. His body was never found. He was awarded a Purple Heart. My mother said he joined the paratroopers to make more money to send home to his parents. My mother said he was a good, beautiful person who was willing to serve his country as did all four of his brothers. I wish I could have known him, but I am very proud to call him my uncle and proud of the sacrifice he made for our country. Jacquelinne could you tell your father’s name ? Remember him booking a holiday to go to Holland as he said he was there with the army Arnham I think he mentioned ( not sure of the spelling ). And came from Glasgow Scotland. Jacqueline, I don’t have your father in my data … can you tell me more ??? Do you have some pictures with him with his uniform … something who could help me ? this is my email where you can contact me ; paracsm@Hotmail.com . My father is BGEN (RET) David Edward Thomas, MC, USA. He was the first Regular Army Medical Officer to graduate from Airborne School. He held several different medical positions while in the Airborne which included serving, as a CPT, with then CPT James Gavin. “Slim Jim” Gavin finished WW II as a MGEN. My father finished the war as a MAJ. GEN Gavin was Infantry, my father was Medical Corps. So is life. My father’s assignment, prior to his shipment overseas, was as the Regimental Surgeon of the 508th Parachute Infantry Regiment. The 508th was latter attached to the 82 Airborne Division. To make a long story short: he jumped into Normandy, was captured with a medic from the 101st Airborne Division, got put to work in a German field hospital which was shelled by artillery (probably American), and escaped during the shelling, He was later recaptured by (I think) the 1st ID. He had no identification (the Germans had taken all his stuff – to include his dog tags) and he was wearing a uniform (the Airborne combat uniform) unfamiliar to those who captured him. He was held in the POW compound until a representative from the 508th arrived to ID him, sign for him, and returned him to the 508th. He was involved in the “Battle of the Bulge” and made the combat jump into Holland. With all his combat exposure, and though he was shot at (after which he decided to remove his Red Cross (on white) arm band and paint over his helmet), he ended the war without a scratch. At the end of the war in Europe, he was quickly returned to the US. It was the policy of the War Department to return former POWs as quickly as possible to the United States. My father served in WW II, the Korean War Theater, and Vietnam (where he was the CG of the Medical Brigade). He died in 2002 shortly after his 90th birthday. I have lots of stories and should probably write a book. He did not talk much about the WW II until after one of the first 508th reunions – about 40 years after WW II. He spoke more about the war the last two years of his life. One of my fondest memories of my dad is his jumping with me in 1967 at Ft Bragg as my platoon medic. He wore his “old” 508th uniform – and it still fit! It was his first jump since jumping into Holland. He had Senior Jump Wings and continued jumping until he was awarded Master Wings. His assignment in Vietnam was both interesting, and controversial. Among other actions, he advocated “the reduction and control of sexually transmitted disease”, which was epidemic in many units, “by making the ‘product’ available thru the PX system. Thus allowing both the provider and buyer to be medically inspected and therefore provide a safer product”. I do not know all the ramifications or details of the proposal, but I do know it caused quite a stir at the Army Surgeon Generals Office and in Congress. I believe it cost my father a second star. It is of interest to note that such “actions” was common practice in some units – but NEVER made public knowledge, nor had it ever been previously suggested by the senior medical officer in Vietnam. After 33 years of service, my father retired in San Antonio, Texas. I know one thing for sure. My father was most proud of being Airborne, and of having been a soldier in the 508th PIR. Rest In Peace, Sir. I look forward to joining you when called. CPT (Ret) Normand E Thomas, AUS. I have your father in my roster but could you tell me more about his units … I have him at the 307th Airborne Med Co detached to the 508PIR and I have him also at the 503PIR and 505PIR ??? maybe I’m wrong ??? I’m friend with Doc McIlvoy and Doc Franco’s families . Shoot fire Domi. I have started to reply twice to your email but, when my wife interrupts me, I lost my “in progress” responses to the Internet black hole. So, I will start again. After I respond to you, I will respond to Cheryle Fuller. I have three appointments this afternoon so I may not get both responses finished today. As far as I know, my father was NEVER in the 307th Airborne Medical Company. However, I do not know in what manner medical officers were assigned during WW II. They may very well have been assigned to the Airborne Medical Company for accountability and pay, and attached to their combat units for all other actions. That is a question which needs researched. My father was injured in a training jump at either Ft Benning or Ft Bragg (Camp McCall) while assigned to a battalion other than the 508th. His “old” unit shipped out to North Africa while his leg was still healing. He was considered non-deployable. He was thus assigned to the “then forming” 508th. He was with the 508th thru their basic training, unit training, and jump training in the United States. He had completed his jump training prior to being assigned to the 508th PIR. As a matter of fact, I believe he completed his jump training prior to Pearl Harbor. I have his Certificate, someplace, and will look for it later. The 508th left the USA via boat and arrived in the British Islands. His cantonment area was in Nottingham, England area. Training continued for the 508th PIR up to D-Day. As earlier stated, he stayed with the 508th thruout the war – except when he was in the service of the German Army. I have no knowledge about the unit that captured him, but he said the Nazi salute was quite prevalent whenever a staff car showed up at the field hospital – which, as I remember, was not a hospital at all but a large chateau. I am not sure if he had assignments in the 503d and/or 505th. Because he was an “early” Paratrooper, he may have been assigned to a number of units as they were created. I will look at my records and find out what I can and report later to you. I have pictures and newspaper articles which may be of interest to you. I would be most happy to send copies. However, I would need your mailing address to do so as I am not very PC literate. I also have an unedited, and incomplete, memoir of some of his service, mostly about WW II. ANOTHER STORY HAS JUST ENTERED MY BRAIN HOUSING GROUP. Better write it down before I forget! To jump with me in 1967, my father needed to be on jump status. He was the Commanding Officer of Womack Army Hospital, FT Bragg, NC. His TO&E position WAS NOT considered a jump slot. What then to do? Well, as it so happened, we lived next door to LTGEN York, the CG XVIII ABN Corps and Commander, FT Bragg. I am unsure of the relationship between GEN York and my father but I think they had known each other for a long time. Maybe even since WW II. Well, to make a long story short, following is what I believe took place. However, I have no proof. My father went either to GEN York’s quarters or to his office at HQ, XVIII ABN Corps. They may have talked about old times, may have had a drink or two, and my father presented his problem. “Sir, I would like to jump with my son, Sir, who is being assigned to th 82d as a Infantry Platoon Leader. But alas, I am not on Jump status. To jump with my son would be a newsworthy event. 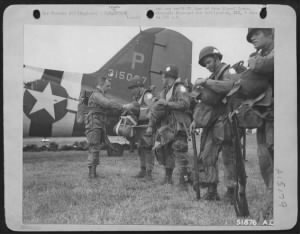 The 82d, the XVIII ABN Corps, Ft Bragg, the Airborne Community, and the United States Army would receive positive press coverage. The event would help with retention and recruiting and would lead to the development of an Annual Leap Feast at Ft Bragg. Considering all positive potential, do you think there is any way I could be reinstated to jump status, Sir”? OK, maybe my imagination goes a little bit too far. The bottom line, however, is that my father was assigned an “additional duty”. He became, so I was told, a Special Staff Officer with the title of “Special Surgical Consultant to the Commading General, XVII Airborne Corps”. Generals can do almost anything! OH, AND ANOTHER STORY. BUT I MUST RUN NOW. Please remind me to tell you about his “SECRET” mission, which, I hope, is no longer a secret. Amazing story Gus … thanks so much to share it with us … My email is ; paracsm@hotmail.com . Do you know the website 508pir.org ??? and the 508PIR family and Friends ??? I’m a member from this association and they have a reunion every year … in 2018 it will be in Fort Bragg . Mr. Thomas, you have an amazing history to be proud of! Not many men can say they served along side their dads or uncles! What a wonderful heritage you have to share with all of us. I would love to hear those stories. I wish my dad had known your dad was in San Antonio. I have a house in Gruene, (I started the resurrection of it) and would have loved to entertain both of you since Gruene is so close to San Antonio. It did not seem that many of our heroes had much to say afterward or connected with each other for long. Sadly, both our dads are dead. I am sure if mine had his surgery here in San Antonio, and your dad had acknowledged him, he would have lived many more years. They probably would have stayed up all night many mights giving their perspectives on the different troop movements and battles.